Honda Cars Philippines, Inc. (HCPI), Honda’s Automobile unit in the Philippines, showers everyone with the biggest savings and the most exciting deals this rainy season. Customers may avail of exclusive discounts and low down payment schemes by purchasing select Honda Vehicles from June 1 to 30, 2017. 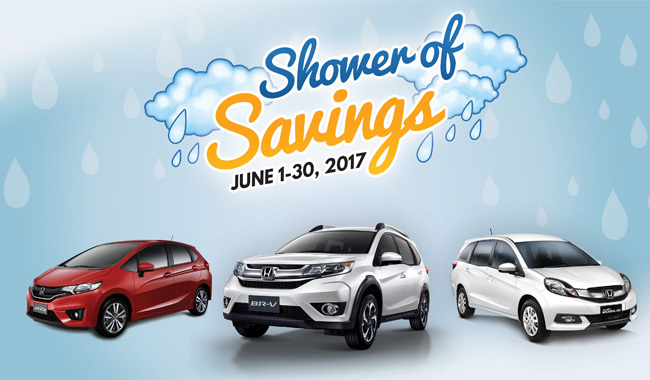 For the month of June, customers may experience shower of savings as Honda will give away cash discounts upon purchase. Aside from this, select Honda Vehicles will come with special limited packages. Customers who will purchase a CR-V will be given a choice of Modulo Aero Kit or Modulo Trekker kit accessory package, while those who will purchase an Odyssey will be given a choice of either front fog lights, or front & rear sensors, or an additional Php 10,000 cash discount. To make this season a more enjoyable purchase experience, Honda will also offer low down payment schemes and bank financing promos for as low as P62,000 down payment for the All-New BR-V S CVT and P18,000 low down payment for the CR-V 2.0 V MT. Customers may also avail of the Honda Protect Plus Extended Warranty for an additional 2 years of warranty or 40,000 kilometers whichever comes first, at a very affordable price. Honda also invites everyone to see The New City along with other Honda Vehicles at the SM Mall of Asia Atrium on June 8 – 14, 2017. For complete details on “Honda’s Shower of Savings” campaign and other ongoing promotions and activities, visit www.hondaphil.com or any authorized Honda Dealership nationwide.